You can make change to your FileThis account anytime, including changing your payment information, password, or communication preferences. To modify your account using a browser, click Hello, [Your Name] in the upper-left corner of the FileThis window. Account: Change the number of connections you are allowed, the amount of storage space provided, and your billing information. 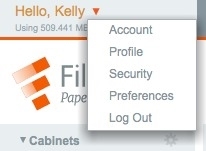 Profile: Change your name and email address, which is used for your login and for communications from FileThis. Security: Change your password and specify how long your account can be inactive before automatically logging you out. Preferences: Customize your communications from FileThis. By default, you receive email when new documents are delivered from your connections, there is a problem with a connection, and there is information about your subscription. To make changes to your account using the FileThis mobile app, display the home screen and tap the Settings button next to your name.